Getting married in Troy, Rochester Hills, Sterling Heights, Auburn Hills, Bloomfield TWP, Charter TWP of Clinton, West Bloomfield TWP? Located on the Northside of Metro-Detroit these cities have a great deal to offer individually as well as collectively.Troy is one of the most diverse cities in the area is a host to a number of great potential venues for weddings, receptions and for wedding photography. Rochester Hills offers the charm of a great downtown and several stand out venues (Royal Park Hotel, Great Oaks Country Club). Auburn Hills is a little further north and is known for being home to Great Lakes Crossings, a large outlet mall, and The Palace, a popular concert/athletic venue. There are a number of unique venues here as well. Clinton Township is more to the east and has access to some of great venues and is very close to some of the area’s most popular lakes- which is great for photography and potential wedding/reception venues. West Bloomfield is a beautiful area, well established and near-perfectly maintained. West Bloomfield also has several local options for wedding, reception and photography venues. 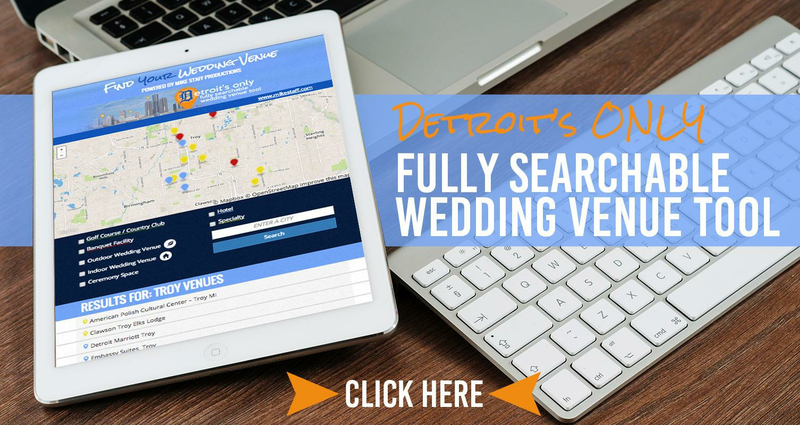 Want to get married in North Metro Detroit? Haven’t picked a venue? Let us help! Mike Staff Productions provides Award Winning Wedding DJ, Wedding Photography, HD Wedding Videography and Wedding Uplighting services. We make it simple for you to plan your perfect Michigan wedding with custom a la carte services, or bundle two or three services together. Check out the most value-packed wedding packages in Michigan.